Turn a dark, cold Autumn evening in to a beautiful celebration of warmth, cosiness and calm with this restful 30 minute yin yoga sequence. 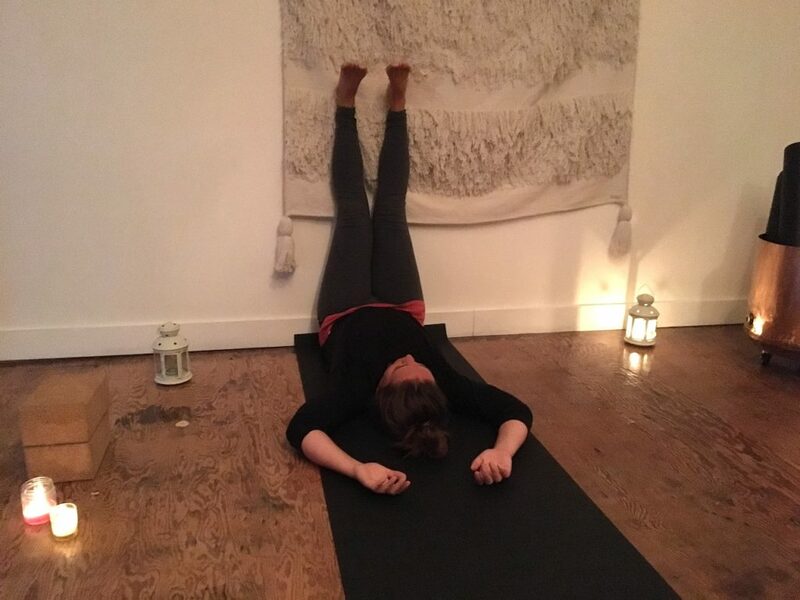 This sequence is perfect for the end of a busy day when you feel tired, low energy or you just want to unwind. 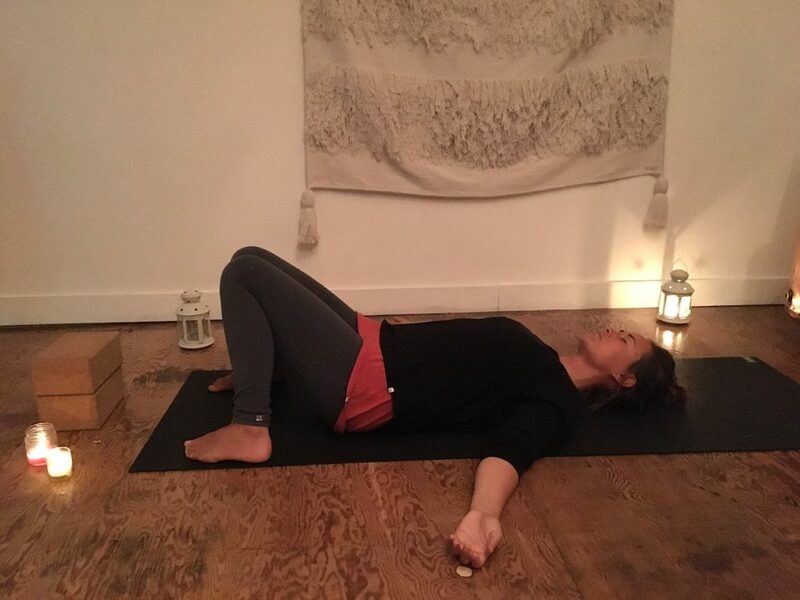 Each pose is held for just a few minutes at a time so there’s nothing difficult or intense, just beautifully gentle yin poses that will help you to slow down, listen in, rest and relax. When I’m practicing this sequence I like to spend a few minutes creating the cosiest atmosphere possible to make even more enjoyable. 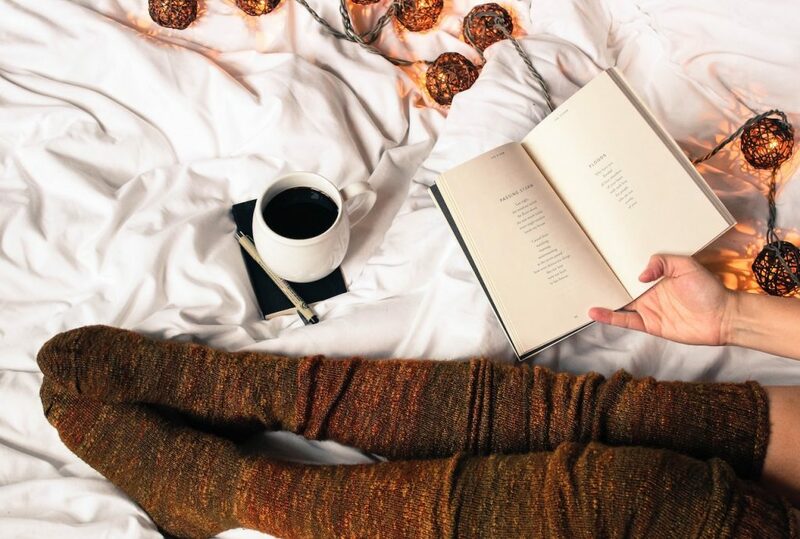 I’ll light plenty of candles to create a warm, soft glow and I’ll play some relaxing music (try my autumn yoga playlist). I’ll keep a fleecy blanket close by in case I get cold and I’ll wear my comfiest clothes and fluffiest socks. If I’m going to have dinner afterwards I’ll prepare everything in advance (having a pan of roasted butternut squash soup ready to heat up and enjoy afterwards is amazing). Finally I’ll switch my phone to airplane mode so there’s no distractions whilst I practice. Lie on your back with your knees bent and feet on the floor mat width apart. Let your knees rest in on one another so you can completely relax your legs and hips. Turn your palms to face up and relax your shoulders. Use your 3 minutes in this pose to start shift away from the busyness of your day. Breathe deeply and turn your attention inward. Pay attention to just how you’re feeling in this moment (without any judgement)…what are your energy levels like, are you feeling any tension or tightness in your body, what thoughts is it time to let go of? Let each breath you take slow you down and listen in! Straighten your legs out along the floor. Keeping your hips, centered walk your legs as far over to the left as you can. Then shuffle your shoulders as far over to the left as you can. Take hold of opposite elbows above your head. You should feel a stretch down your right side. To intensify the pose cross your right ankle over your left. 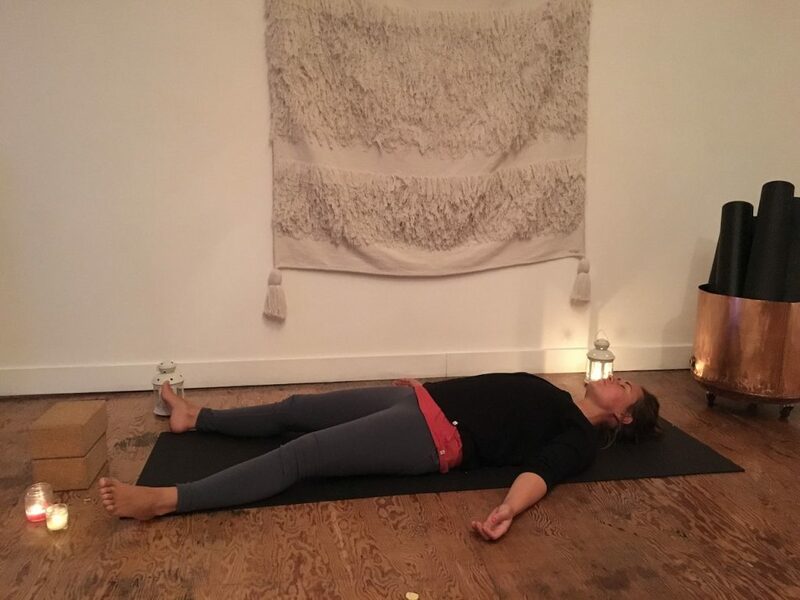 After 3 minutes take a moment to reset in constructive rest pose (see above) before completing the pose on the other side. Hug your knees in to your chest. Keep your head and shoulders relaxed down on the floor. You can also rock gently side to side here. From knees to chest pose roll to one side and come up to sit. Extend your right leg straight out along the mat. Bend your left knee bringing the sole of your left foot to your right inner thigh as your knee drops open to the floor on your left. Slowly fold forward over your straight right leg, rest your hands on the floor, relax your shoulders, let your back round and your head drop towards your shin. Keep your right foot relaxed. After 3 minutes swap sides. Make your way up in to table top pose (hands and knees) then bring your right knee to the floor behind your right wrist with your shin across the mat. sink your hips as close to the floor as possible. Fold forward as far as is comfortable. Repeat with the left leg forward. Sit with one hip up against the wall. Swing your legs up the wall lying down on to your back. Shoulder shuffle in until your legs are resting straight up the wall. Rest your arms up overhead. Lie on your back with your feet as wide as your mat and your arms along side you palms facing up. A restful 30 minute yin yoga sequence that's perfect for the end of a busy day when you feel tired, low energy or just want to unwind. Hi Jen, I have not tried the Yin Yoga yet, but I will. I went to my first yoga class, today. I loved it, found out I need more stretching than I thought I did (lol). I want to thank you because if it was not for your website, I probably would not have gone. Thats really wonderful to hear Carol, I’m so pleased that you’ve been enjoying reading the Shine blog and that you went to your first yoga class!! If there’s anything you would like to learn about in future blog posts just let me know. And I hope you get the chance to try the yin sequence too, it’s perfect in the evening when you feel like a gentle stretch. Thanks, after an early flight from portugal this morning and max 2h sleep today it was perfect to wind down. Your Mail came at the right time! Thats so great to hear Maria. Yin yoga is sooo perfect after travelling for grounding and also when you’re really tired. Really glad you enjoyed the class. Have a wonderful week.